Where in the world is Rob Curley? I asked this question recently and voila. This article details Curley's rise from Topeka, Kansas to the glitter of Las Vegas. The warning? Technology isn't the savior of hyperlocal, people and relationships and knowing your community's needs are your keys to really building community. Is anyone on staff actually reading the mobile version of your news website? Tables, slideshows not showing up in mobile content of news websites. Profile of Debbie Galant and Baristanet of Montclair, New Jersey. After several days at the Journalism that Matters -Pacific Northwest gathering, we’ve been asked to reflect on what ah-ha moments, actions and emotions we’ve developed during our time. One of the most intriguing ideas to come out of the JTM session I hosted on Locally Grown News was the idea of slow news. The first ah-ha moment for me came when I looked at what was happening nationally and the movement toward producing fewer papers — going from a daily metro newspaper to perhaps three or four times a week publication. While this has reduced expenditures and is often accompanied by layoffs, I began to think that the change signaled a difference in how news was produced. Even with fewer employees, do the news staffs feel that they can produce more thoughtful, context-filled, richly sourced stories with the additional time they now have? This thought carried into the Locally Grown News session where we examined using the locavore movement — eating locally — as an opening for conversations and sharing of news in a community. The idea is to use the analogy of the farmer’s market, rather than the town square, as the metaphor for doing news differently in a hyperlocal space. Our group found the food metaphor a rich way to explore not only how hyperlocals might use this content niche as a focal point, but began to examine the food cycle itself and how it maps to the roles, practices, behaviors, rituals that define a different way of doing journalism. What rich, fertile ground (oh, the puns!) that helped to grow our vision of a new kind of news process. 1. Who is fed by this information? Who is starved? 2. How does this information nurture the community? 3. Where did the seeds of this idea come from? 4. Who contributed to the preparation of this story? 5. Where else/how else/in what other forms might this story be produced? 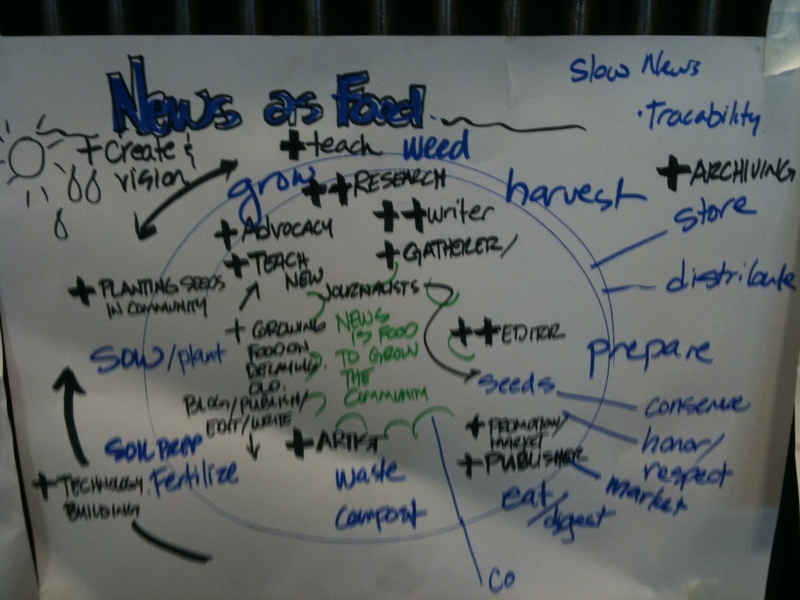 Our collective passion for what we do as journalists and foodies led us to produce a diagram that maps our roles as media in the food cycle. So here I am, back after a brief hiatus, taking Locally Grown News on the road. I’m roadtesting the concept of a “sustainable journalism incubator” at the Journalism That Matters “Reimagining News & Community in the Pacific Northwest in Seattle on January 7-10. The concept of an incubator morphed from the franchise idea. Why? The goal is to create a collaborative environment, regardless of name. However, the term franchise has lots of legal connotations that were not intended in the original project concept. So the Women’s Community News Franchise has morphed into the rich environment that an incubator can create. My goal is still the same: Create locally grown owner/operators of hyperlocal online communities. Give them the training and the tools to get started. Provide them with ongoing coaching to be sustainable. Create a community of operators that help each other by sharing their unique talents. Use technology to connect people and affirm the value of place and neighborliness. A virtual/physical incubator might best service the hyperlocal niche with services, support, planning, development and content. I’m here to recruit beta testers for the Locally Grown News concept and the Pacific Northwest is a great region full of entrepreneurial spirit and folks committed to quality journalism. 1. Legally formed an LLC. 2. Negotiated contracts with software developers for both the content management system and for mobile-application development. 3. Found a domain name that reflected our local flavor (can’t resist the metaphors) and the content area that we’ll focus on (more on that later). So I’ve laid the groundwork and am ready to go. I’ll be sharing ideas and experiments from the Journalism that Matters conference and hopefully bring back some beta testers as well!